Welcome to the Rutgers New Jersey Medical School Infectious Diseases Fellowship Program website. Rutgers Biomedical and Health Sciences is the premier academic provider of health care in New Jersey and leader in infectious diseases research. We are exceptionally proud of the quality of our fellowship program and the success of our graduates. Our program offers a rich infectious diseases training experience with three unique hospitals – University Hospital, Hackensack University Medical Center and the VA Medical Center – and an incredibly diverse patient population. The HIV program at University Hospital is the largest and most comprehensive in New Jersey with state of the art clinical care and research with participation in both the AIDS Clinical Trials Group and HIV Prevention Trials Network. With one of the largest oncology and stem cell transplant programs in the country, Hackensack University Medical Center offers fellows in depth training in infections in cancer and transplant patients. The VA Medical Center provides fellows with multiple educational experiences in antibiotic stewardship, infection control, and HCV care. Our faculty across all three campuses are integrally involved with fellow education from bedside teaching to case conferences and didactic sessions to mentoring of research projects and scholarly activities. The Center for Emerging Pathogens, the Global Tuberculosis Institute and the Public Health Research Institute provide additional educational opportunities. Please review our updated website for more details about our fellowship program and the application process. I encourage you to submit your application and welcome the opportunity to meet you and share with you the many strengths of Rutgers New Jersey Medical School and our fellowship program. Dr. Dever is Vice Chair for Faculty Development in the Department of Medicine, Clinical Chief of Infectious Diseases and Director of the Infectious Disease Fellowship Program at Rutgers New Jersey Medical School. She received her Doctor of Medicine from the University of Texas Medical Branch in Galveston and completed her Internal Medicine Residency and Chief Residency there, followed by an Infectious Disease Fellowship at the University of Texas Health Science Center at San Antonio. She subsequently completed a Microbiology Research Fellowship at Rockefeller University in the laboratory of Dr. Alexander Tomasz. 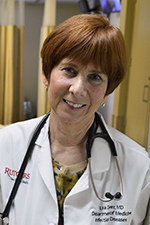 Dr. Dever has been a Faculty member at New Jersey Medical School since 1994 and Program Director and Clinical Chief of Infectious Diseases since 2005. She has been actively involved in patient care, education, and clinical research. She has published numerous journal articles, text chapters, and monographs focusing on the study, diagnosis, and treatment of infectious diseases. Her clinical and research interests include HIV infection, antimicrobial resistance and the management of orthopedic infections. Copyright © , Rutgers, The State University of New Jersey, an equal opportunity, affirmative action institution.